The past couple of months haven’t been the best for Ithaca development. Apart from the recent lull, most of the high-profile projects have engendered some animosity or involved in a publicly relations mess. In the case of the Hilton Canopy, that would be the incident with the sure-footed construction work on the scaffolding. My goal when reporting it back in August was to be impartial and thorough and I still I don’t know enough about the work environment to make a comment. From the public comments and my emails, it’s not 100% clear if there were violations and how severe they were; there’s some subjectivity in their application (harnesses are to set up in ways that don’t pose other safety concerns or obstacles, for instance, so if it could be proven that it would have been a risk a harness wouldn’t have been required). OSHA is reviewing and will make their judgement calls as they see fit, even if it takes up to six months to hash out. On the bright side, the Hilton is moving along, the warehouse-style windows are being fitted and most of the sheathing has been attached to the exterior steel studs. The water-resistive barrier will prevent moisture seepage from damaging the gypsum sheathing panels. The yellowish Behr paint “applesauce cake” colored fiber cement panels were replaced with a somewhat darker and browner tone, “sauteed mushroom” from rival Glidden. As Glidden Paints says, a “(m)id-toned warm beige, this color makes a statement as an exterior body color as well as an interior accent wall or warm meditation space.” I don’t make these names up, I just report them. 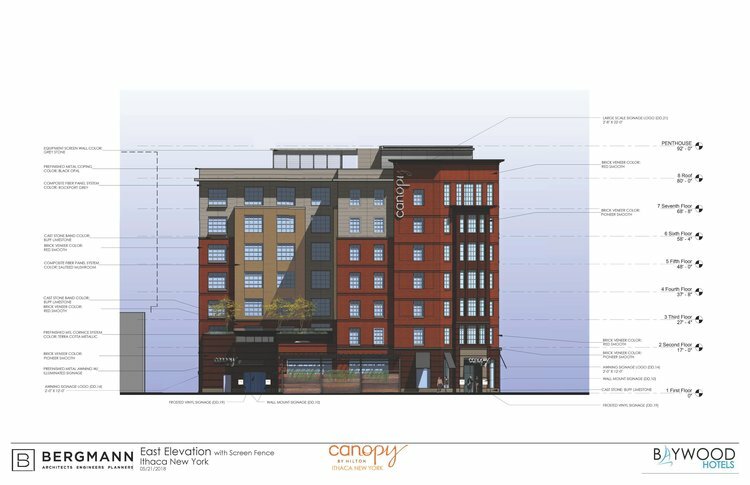 There hasn’t been too much news about the project apart from the scaffolding controversy; the Canopy brand has been touting Ithaca-area attractions on its facebook page and the brand website states a mid-2019 opening.